ClientExec Supports Credits and Debits in Multiple Currencies! When using ClientExec, you will find out how easy it truly is to use. Adding a credit and a debit is as easy as selecting an invoice, and then selecting the options on it. You don’t have to do anything more than that! ClientExec offers a wide array of versatile services, so you can get the flexibility and scalability that you need from this software program. ClientExec also supports credits being added in multiple currencies, which is something that has never been seen in a billing system. Most other systems generally work off of a single currency that is defined when the installation process begins. Being able to expand the types of transactions that you can process is great for your business. 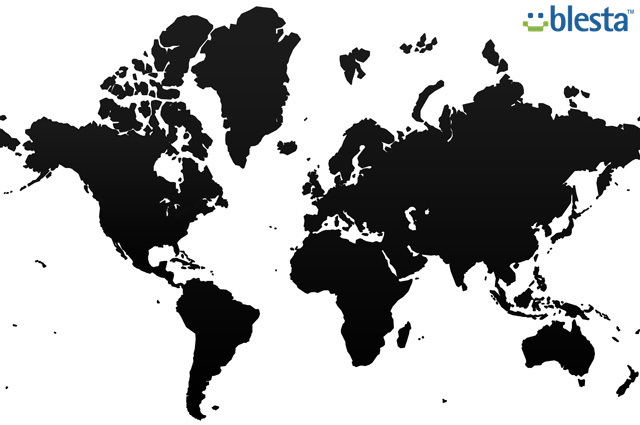 If you are looking to create a global business endeavor, then you can rest assured that ClientExec can grow with your business. If you are just looking to offer your services to a broader range of customers, then allowing your billing system to process transactions in multiple currencies will give you an unparalleled opportunity for expansion. Being able to apply a store credit with ClientExec is a very necessary feature for anyone operating an e-Commerce business. You can apply a credit to the account that you select and then when the client makes another transaction, it will either be marked as paid, or if the credit is not sufficient to cover the transaction, it will be deducted from the total amount. You can also apply a credit specifically to a single account, invoice, or product, and now with ClientExec, you can perform this function manually. ClientExec has really added to the appeal of this software program. Because ClientExec offers so many various features to suit the needs of any business, you can integrate it easily into your existing control panel to take advantage of the benefits of automation and management. Only a select amount of major billing systems support multiple languages. English speaking people design most billing system software, and thus they overlook the need to support other languages such as Arabic, Spanish, French, Italian, German, and others. Some billing system programs support multiple languages, but they charge extra for the support. However, with a Blesta license, you will be able to take advantage of multi-language support for your site at no additional charge, and Blesta is taking the billing system industry by storm with this innovation. If you are a reseller, it is even more important that you expand your potential client base by offering your services in another language with a Blesta license. Unlike most billing systems Blesta was built with multi-language support in mind. Blesta has quickly become one of the most used billing systems on the market for either specific niches or resellers because it is so easy to use, and it is functional right out of the box. When you purchase a Blesta license, you will see that there is a Language Utility that will allow you to choose between many different translations so that you can add the multi-language support to your virtual environment. You can either use some of the pre-made translations on Blesta, or you can create a translation yourself. After you have added the languages to your site with Blesta, it is important to go back and make sure that each part of your site is translated correctly. Many of the language packs will utilize artificial intelligence to translate the words, and this will give you a good, general translation. However, if it is not as good as you would like it to be, you can go back and make the changes yourself on Blesta so that you can be sure that your customers will have the best possible impression of your site as soon as they enter. Blesta is one of the best all-in-one systems on the market. When you get a normal billing system, it is just a billing system and then you need to program all the automation yourself. This programming can include your payment processor and control panel provisioning. By licensing Blesta, you just type in your access information to your merchant processor and enjoy the automatic integration of Blesta. You can also create detailed and customized web forms for your billing system. A Blesta license is a great way to get all of the functionality and scalability that you need in your billing system, and the Blesta features are some of the best on the market. You can streamline your order process with generated web forms that you can easily place on your website. Blesta features have been upgraded recently to include more adaptable modules and an intuitive, easy to use interface. A Blesta license will give you exclusive access to all of the Blesta features and the capability to create customized web forms. After your customers use the web forms and the processor approves the payments, your billing system can link with your control panel and automatically provision the server. Blesta is truly on the cutting edge in terms of developing an extremely functional piece of software, and the Blesta features are the best part of purchasing a Blesta license. Licensing Blesta is less expensive than licensing some of the other billing system software programs on the market, so you will not only be able to benefit from the amazing set of Blesta features, you can also affordably lease a Blesta license on a monthly basis. Web forms, automated invoicing, account creation, and much more will be at your disposal if you choose to buy a Blesta license. One of the billing system software programs that is often undervalued and rich with dynamic and usable features is Blesta. Can Small Hosting Companies Benefit from Using DirectAdmin? DirectAdmin is one of the most user-friendly web hosting control panels that has ever been introduced into the market. DirectAdmin has been around for years, and they have mastered the art of control panel development by allowing web host beginners to easily get started and grasp all of the functions of the software. Since a DirectAdmin license is much less expensive than other control panel programs on the market, it is perfect for start up businesses that need to add functionality, flexibility, and appeal to their hosting environment. DirectAdmin control panel’s interface allows you to view stats of your websites, and you are sure to find these useful when you need to get down to the details. DirectAdmin is made with scalability in mind so as your business grows, DirectAdmin will be able to adapt and provide you with the services that you need to support an expanding business. It is easy when you are first starting out, and DirectAdmin is powerful enough to handle the biggest tasks that it has ever been forced to face. 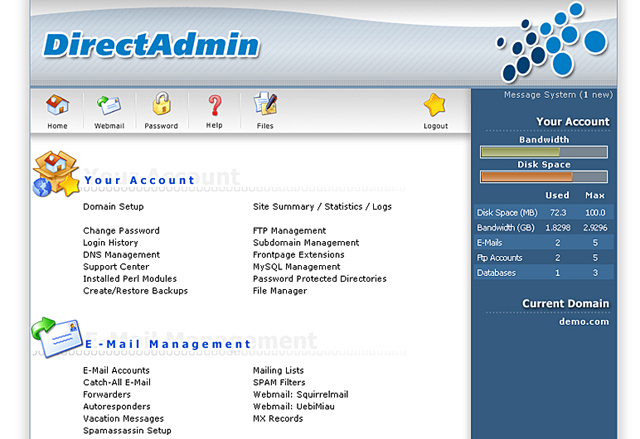 DirectAdmin is one of the most dynamic and powerful web hosting control panels on the market. A DirectAdmin license is extremely cost effective, and the simple layout of the control panel makes it effortless to use for hosting providers or anyone else that is in need of a control panel. By ordering a DirectAdmin license, you can access all of the features that you need to get your business up and running, and in very little time, you will be able to understand everything that this program is capable of completing. A control panel is excellent for businesses that are in need of automation services, and DirectAdmin will allow you to effectively manage your virtual environment while also providing an efficient and user-friendly experience for your customers. The new release of ClientExec 4.1 has sparked a lot of interest and discussion, as people look at how the system has been improved and upgraded. An innovative, unique interface is at the heart of any modern billing system because it must provide customers with the ability to easily use and customize the features so that it will meet their needs. ClientExec has always had their clients’ interests in mind, and they understand that in order to be the industry leader, they must have a portal that integrates everything into one central location. They have done just that, and the end result is fantastic and powerful. The later releases of ClientExec have shown a new dedication to innovation and an understanding of customer needs because they have upgraded their features and provided more comprehensive support for their customers. WHMCS, the most noteworthy rival of ClientExec, has had a central interface for quite some time so ClientExec has chosen to rapidly change the design and functionality of their interface so that they can compete. One of the main reasons that ClientExec has redesigned their interface is because many people that switched from WHMCS to ClientExec requested a more central space to store all of their data and manage their billing system. Both the WHMCS and the ClientExec billing system lead the industry in terms of reseller hosting billing space, and this makes them hard to separate in terms of features and functionality. There are many similarities between WHMCS and ClientExec, and it seems that both companies are fighting to stay competitive in this rapidly changing marketplace. The new release of ClientExec features a lot of new and exciting elements like security enhancement, customer support, better feedback modules, and many other items so if you want to experience the redesigned interface and the innovative features on the billing system software, then licensing ClientExec is the first step to getting your new billing system underway! WHMCS V4.5 Stable – Now Available! WHMCS V4.5 has recently released its stable version, beating ClientExec to the draw with its latest release of their software! WHMCS V4.5 Beta is the culmination of weeks of testing, improving, and 4 months total of hard work to finally release the stable release. 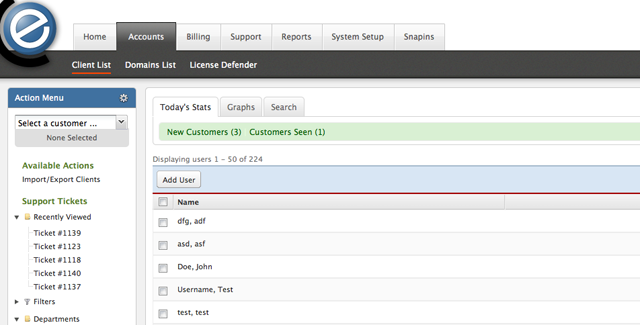 This new release features improvements that were the most common cause of confusion and problems in the past. 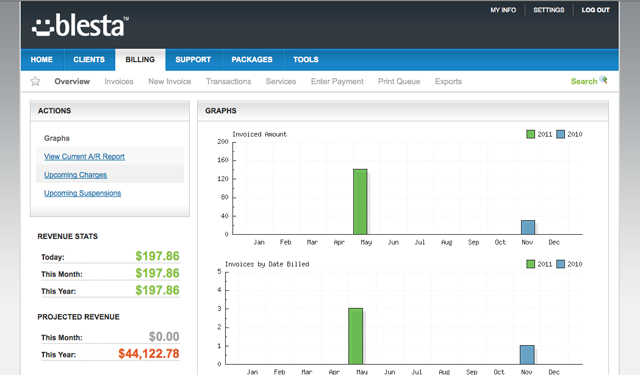 WHMCS billing system has also added many improvements to their invoicing, billing, domain management and much more.